We have benefitted tremendously by the previous generation’s vision and commitment to providing us with a world class transportation system. The connectivity and mobility allows us to compete in a global economy, moving freight to markets and people to work and shop. Infrastructure Week is a good time to reflect upon how we have benefitted from our prior commitments to build our nation’s infrastructure, and what do we want to leave for future generations. When you buy a car, you understand that it is not a one-time expense. You have to buy gas, change the oil, replace parts as they wear out and wash and wax it. The highways we drive on also need maintenance, whether it is a routine seal coat or a full on rebuild or adding capacity. If we are to continue to succeed in a competitive global economy we must have a world class transportation system. We thank our members who are leaders in their communities for this critical investment. 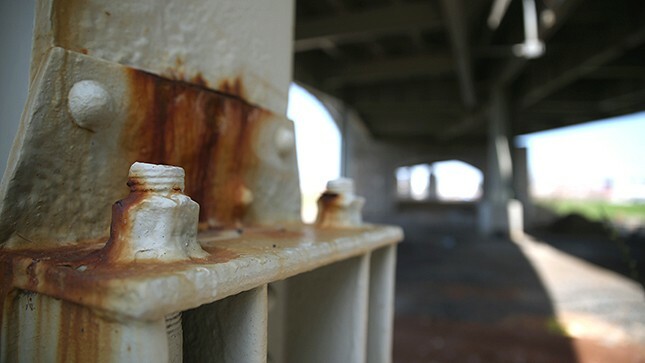 America’s infrastructure investment gap is hitting families where it hurts most – the wallet. 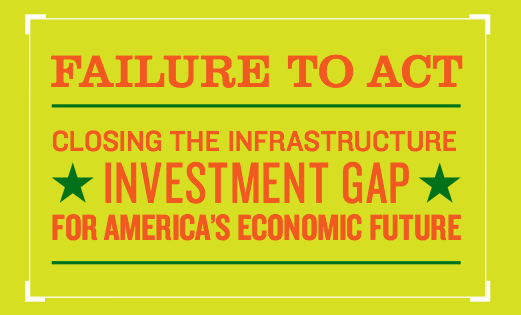 ASCE’s Failure to Act: Closing the Infrastructure Investment Gap for America’s Economic Future 2016 report, released May 10, estimates that continued underinvestment in infrastructure will cost each U.S. family $3,400 a year over the next decade. “Poor infrastructure means more congestion on our roadways, broken water lines and power outages, and an inability to get our goods to market,” said Greg DiLoreto, P.E., P.L.S., D.WRE, Pres.13.ASCE, chair of ASCE’s Committee for America’s Infrastructure. Increased costs of goods in stores will lead to a decline in retail demand, and further layoffs. The decline in personal income will also affect industries that attract households’ discretionary income, such as restaurants, entertainment and the purchase of high-end retail goods, as fewer purchases are made, and those that are made are for lower-value goods than would otherwise be bought. The spiral is that the domestic markets for electronics, medical devices and (perhaps) pharmaceuticals will decline, and with it the employment base of these industries. Travel time will increase due to poor roadway conditions, bridges that are not usable or are partially restricted, and transit services out of good repair. Repair and maintenance costs will also increase due to deteriorating roadway conditions. Higher costs (time and out-of-pocket costs) for shipping and receiving, drives up the cost of products. Increased travel time for service providers will lead to increased costs of services (and increased costs of products increases business supplies purchased by service providers). Products and services will be more expensive, reducing sales and rendering U.S. products less competitive with foreign imports (imports will also be more expensive due to U.S. transportation costs, but less expensive in the framework of overseas production). The higher costs are expected to reduce business demand, which in turn will lead to reductions in business income, profits and layoffs, and lower personal income for people who remain working. Facing that set of facts, the Colorado House leadership introduced two bills which together would have produced $50 million for Colorado transportation needs in FY 2016-17 and perhaps additional funding in FY 2020-21. Even that funding was tied to a politically charged effort to reduce TABOR refunds. Transportation needs were a blip on the radar during the debate on this bill which was killed. In the Senate, a bill co-sponsored by Sen. Randy Baumgartner, chair of the Senate Transportation Committee and Rep. Brian DelGrosso, the House Minority Leader, was far more significant. The bill would have committed 5% of the current state sales tax for the next twenty years with the bulk of that funding to be used as debt payment for $3.5 billion in bonds for significant transportation projects across the state, including two projects on the Ports-to-Plains corridors. Under the bill, the legislature would have referred the bonding to be considered by voters in the November 2016 General Election. While encouraging the sponsors to look for a new revenue source and not opposing the bill, Ports-to-Plains Alliance testified about its concern that while the significant debt would be guaranteed by the state of Colorado, the sales tax revenues identified by the bill could be repealed at any time by future legislatures leaving the Colorado Department of Transportation (CDOT) responsible to pay that annual debt out of its existing fuel tax revenues. Historically that had happened when bonding was approved by Colorado’s voters in 1997 with a similar sales tax revenue approved by the legislature. In 2008 the recession began and in 2009 the legislature repealed the sales tax commitment and CDOT has paid the annual debt service ever since resulting in even less fuel taxes funding available to maintain existing transportation assets. Those 1997 bonds will be paid off this year with the opportunity to return those funds to CDOT’s use to maintain existing transportation assets. This bill passed the Senate. Over the weekend, discussion continued about amending the bill to remove the sales tax from the bill and replace it with a new revenue. The Colorado Motor Carriers Association, a Ports-to-Plains Alliance member, provided the sponsors with polling and Legislative Council’s revenue estimates for a new revenue source. House Minority Leader DelGrosso introduced the amendment in the House State, Veterans and Military Affairs Committee. The amendment simply allowed the legislature to refer the new revenue source to the voters along with the bonding in November. Ports-to-Plains Alliance spoke in favor of the amendment. In the end the committee voted against the amendment and the original bill, killing any hope for a legislative solution to Colorado’s transportation needs. The Ports-to-Plains Alliance was disappointed at the legislative outcome, but will continue to work with MoveColorado and Colorado Contractor Association to petition an initiative asking the voters to approve a new revenue source at the November election. Polling indicates that the citizens of Colorado recognize that the current situation with Colorado’s transportation system is bad for the economy and their personal lives. It is time for all parts, interests and parties of Colorado to come together for a solution. Will there ever be a perfect solution? Of course not, but doing nothing is not a solution. As Ports-to-Plains Alliance points out, states north and south of Colorado have acted… Wyoming, Nebraska, South Dakota, North Dakota and Texas have all acted to provide additional revenue to address transportation needs. Population growth plus more vehicle miles traveled increasing will simply result in more congestion and reduced quality for Colorado’s statewide transportation system. Last year’s five-year surface transportation bill neither raised the gas tax nor came up with a sustainable funding solution. Instead, Congress financed the measure with a series of accounting gimmicks, such as shifting funds from the Federal Reserve. It’s the problem that no one has been able to solve. For years, there has been widespread agreement in Washington that the nation is facing an infrastructure crisis, with dangerously congested roads and deficient bridges threatening public safety and trade. Time and time again, lawmakers in both parties have expressed agreement that something should be done. Yet congressional attempts to revitalize the country’s transportation infrastructure — which now ranks 11th in the world after slipping from no. 1, according to the World Economic Forum — have gone nowhere. Members of Congress, local legislators, former Cabinet members and experts alike say the impasse largely boils down to one thing. Frederick “Bud” Wright is executive director of the American Association of State Highway and Transportation Officials (AASHTO). We call on the nation to use this major election year to help set the United States on a path to building a truly strong and sustainable transportation system, one that makes visible and steady progress to improving our mobility and quality of life. This year, as candidates vie for political offices across the nation and voters consider policies they want those candidates to pursue, there is one fundamental policy we hope they will keep in mind – how to sustain our multilayered national transportation system. There simply is no way to keep our economy healthy and build more economic muscle if we continue to let our highways and bridges, transit systems, barge routes, seaports and airports fall further behind population levels and strains on those systems.